OVERALL: OMG PEOPLE GO SEE THIS MOVIE!!! NOW!!!!!! I want to see it again. And again! POINTS: As stated earlier in this blog, I love The Terminator! Love it! Now I wasn’t as big a fan of T2 as others and Judgement Day was good but sad and the fourth one was – ok. I did thoroughly enjoy the Terminator: Sarah Connor Chronicles on TV. When I heard the whole story was being rebooted I was quite excited and thrilled to see Emilia Clarke in the title role. I was looking forward to a fun popcorn movie. What I got was a full fan loving banquet. 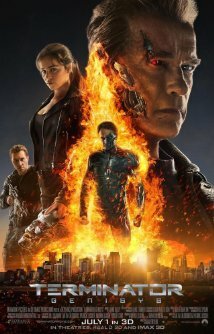 This movie pays tribute to the original Terminator in camera shots, sets, music, clothes. It is like revisiting and saluting at the same time. Then it turns everything on its head and bam! You are in for a fun ride of movie watching. ENJOY! PITFALLS: It would have been nice to have more prominent women characters but I really liked seeing many women in the background. That is good. It tells the audience that although this movie centers on a few characters, the other people inhabiting this world are women too. So hey – a plus! FEMALE CHARACTER(S): Say it people, say it: Sarah Connor. She is the reason I went to see the original years ago. She was mentioned on the movie poster and the hero’s mom and I thought “Well maybe she will be cool.” I was so right and Linda Hamilton totally brought it. Emilia Clarke also steps up as Sarah Connor. Her Sarah has more knowledge than the last one but she has been a bit sheltered and lacks in people skills a bit. You can see the leader she will be and Ms. Clarke has star quality. I liked it. CULTURAL PITFALL(S): More women would be nice. HIGH POINT(S): The whole frickin’ movie. For me the best was the saluting to the original. No no, relax, you don’t need to have seen the original and no it is a remake, it is a wonderful, beautiful, pounding salute. Go See It!!! Also I must nod my head to director Alan Taylor. I was not impressed with his work in Thor: The Dark World, but he did FINE in this movie. I hope he makes many many more Terminator movies!!!!!! BECHDEL TEST (Website): 1 of 3. Drat but Sarah Connor rules. RACIAL BECHDEL TEST (Website): 3 of 3. Hooray for brilliant father and son scientist scenes! DVD/BLU-RAY WORTHY: Yes!!! I will get this asap. LION PAW PRINTS: 4 of 5. It made my heart sing!